We are engaged in offering Centrifugal Lube Oil Cleaner (FT020). 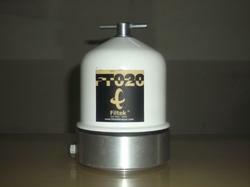 FT020 centrifuge oil filter mainly used for the oil tank capacities from 8 liters to 15 liters. It can separate the finest particles upto 1 micron from the oil. It is available with and without cut off valve (C.O.V) setting. Looking for Centrifugal Oil filter for Mining, Construction ?